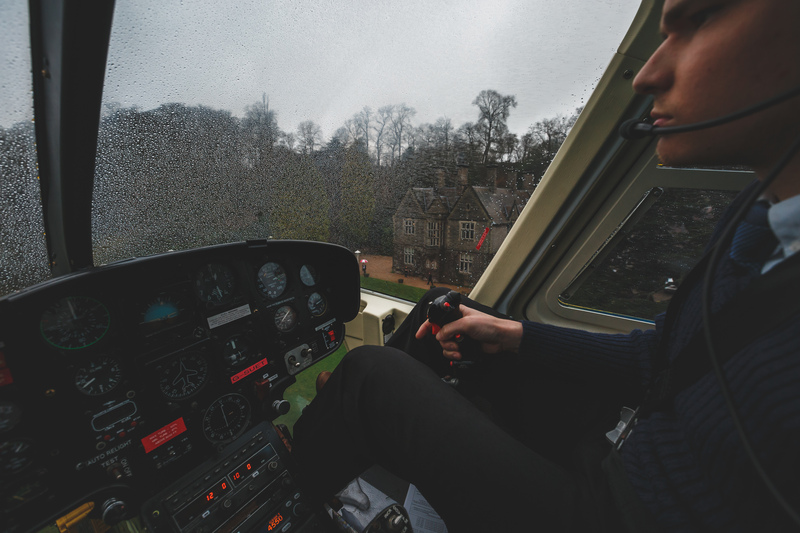 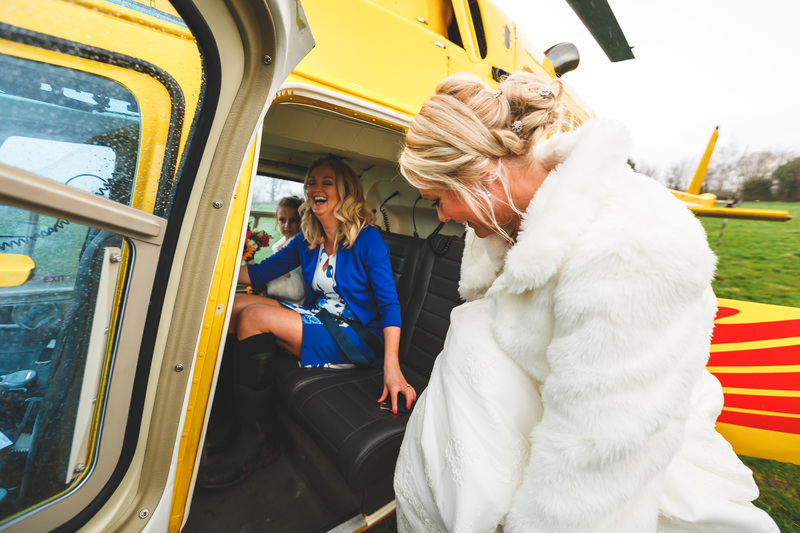 There are many perks to being a wedding photographer – sharing special moments of couples’ happiest day, stunning venues, live music, laughter, working with so many talented and creative vendors but I think travelling in a helicopter has to rate pretty high up on the list! 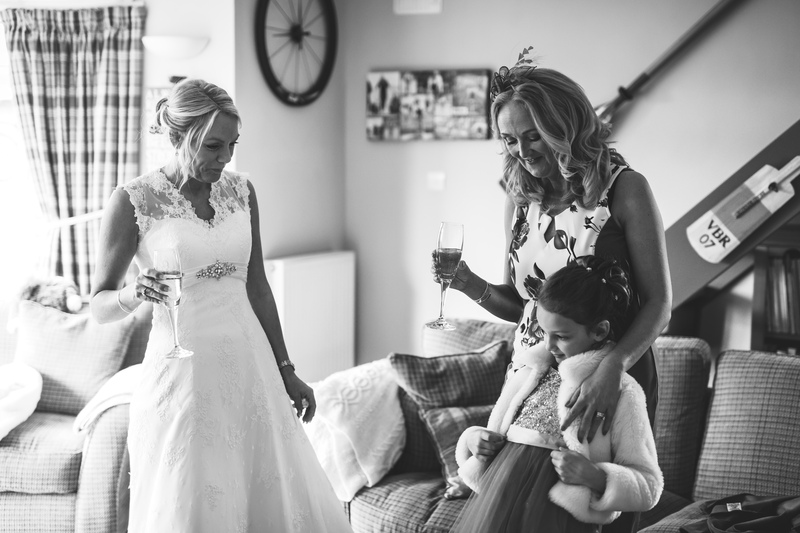 My day started in the small Leicestershire village of Diseworth, with Carolle getting ready at her house with her sister and niece. 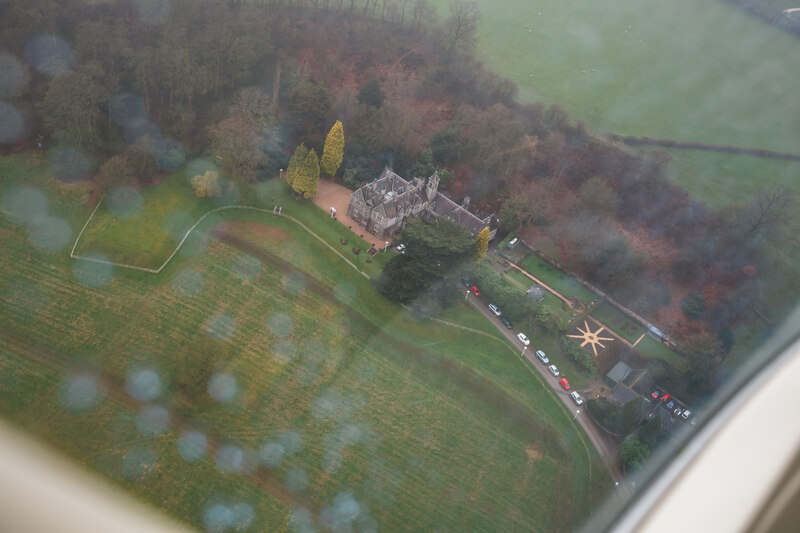 There were slight concerns that the weather may prevent the helicopter ride but we were thankfully given the all clear. 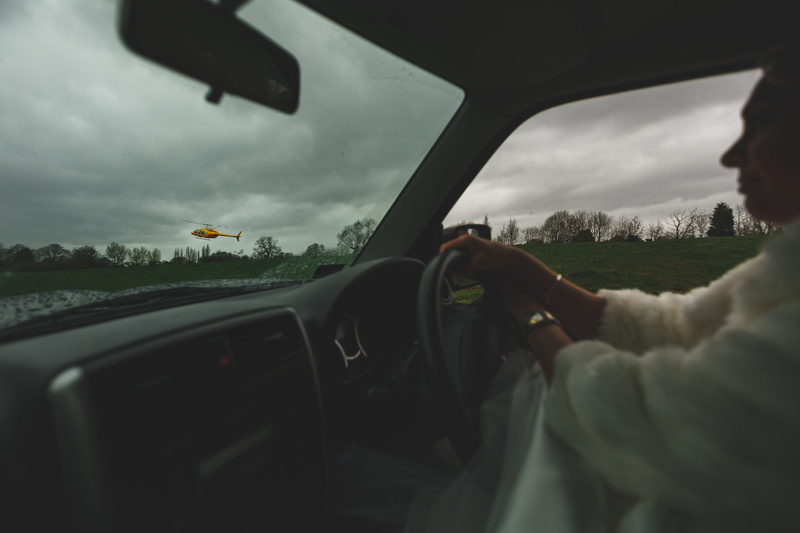 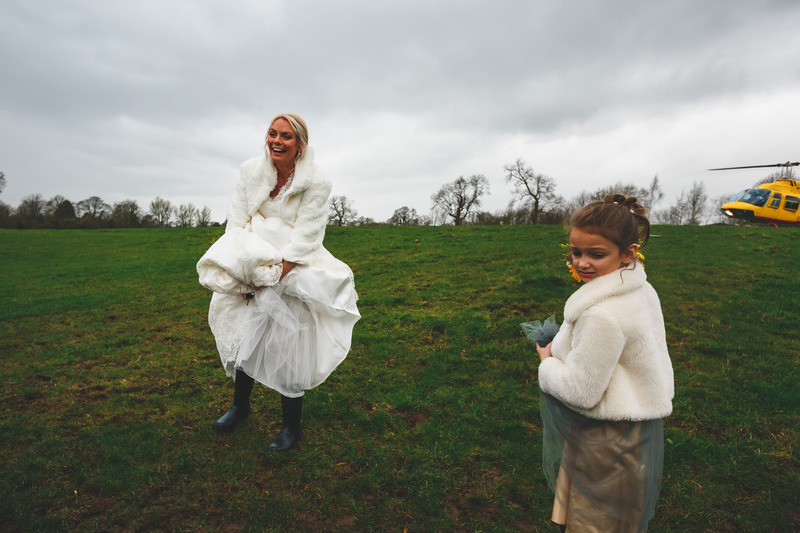 I can’t remember another time where I have been driven to a location by one of my brides but Carolle, in her beautiful wedding dress, drove us to the helicopter landing site in her trusty 4×4 (although when I say trusty, it did get a little bit stuck in the mud so we ended up abandoning it where it was!) 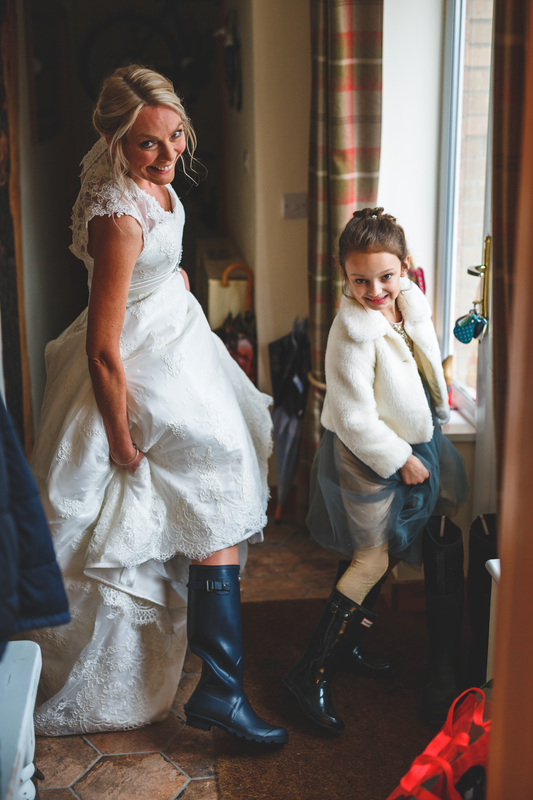 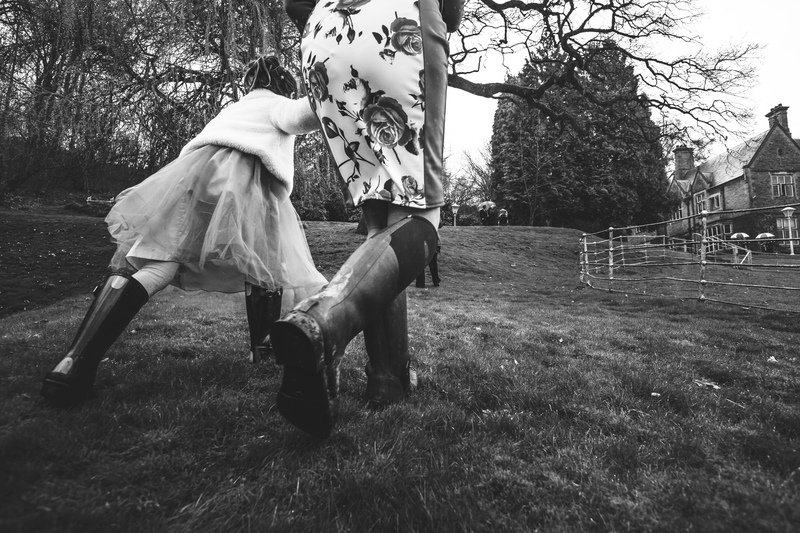 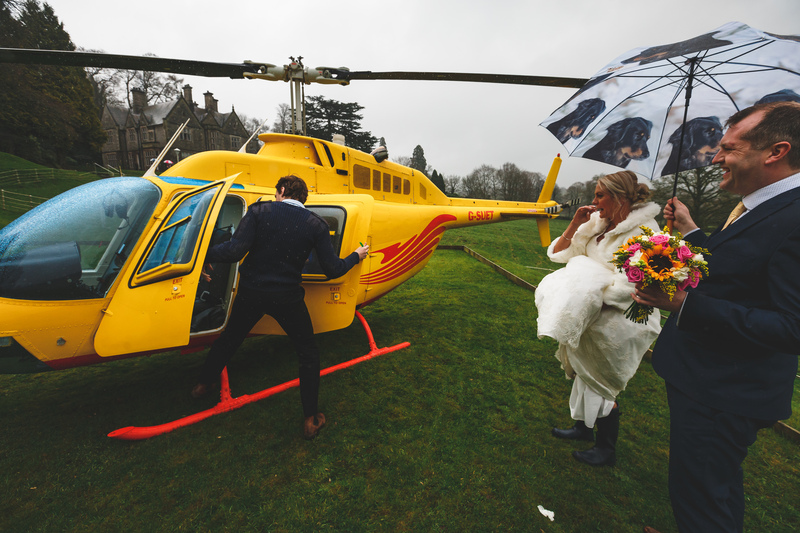 I was so glad that I had followed Carolle’s advice and packed my wellies – the field was slightly precarious to cross to get to the helicopter to say the least. 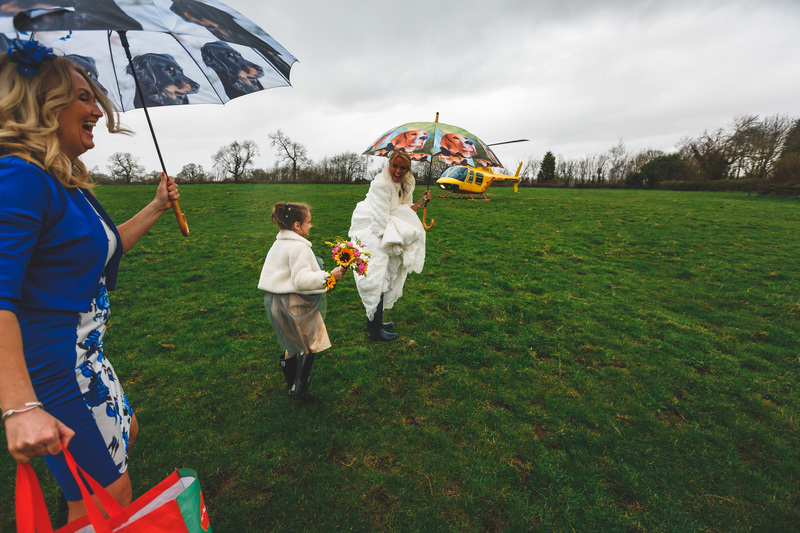 Kudos to her sister for helping Carolle in and out of the helicopter without any mud additions to her dress! 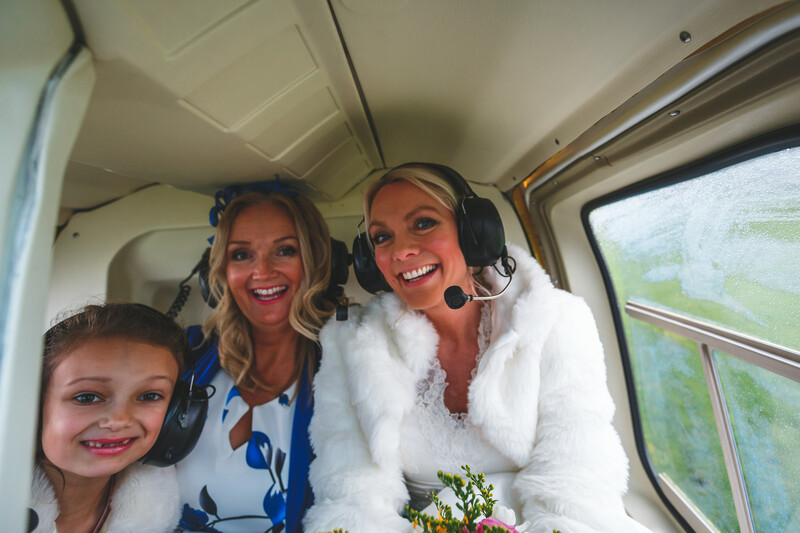 With headsets and hairdos adjusted (Carolle’s, not mine!! 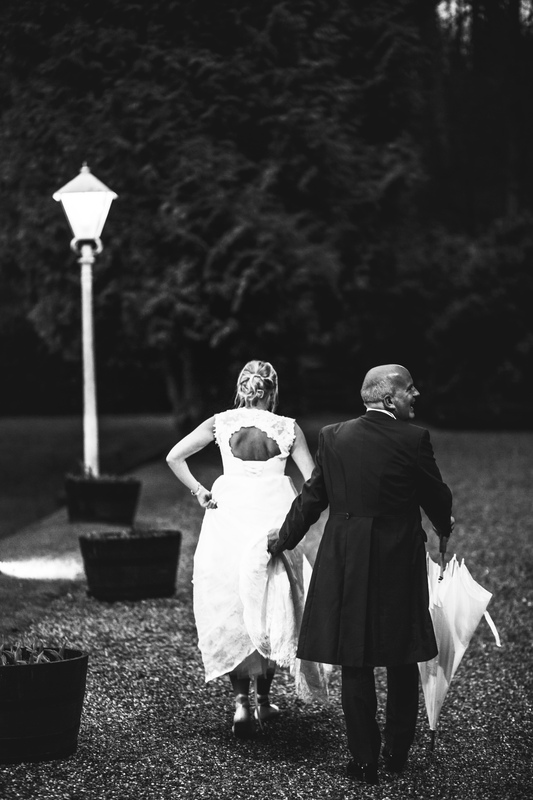 ), we were on our way! 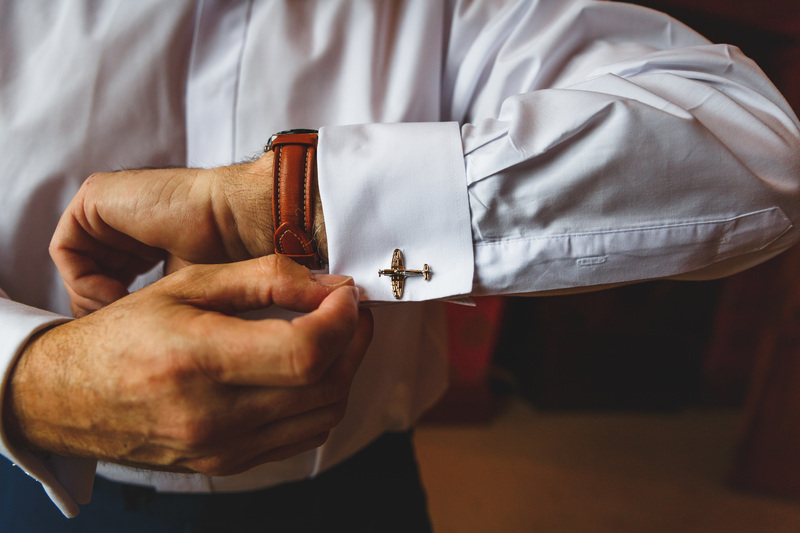 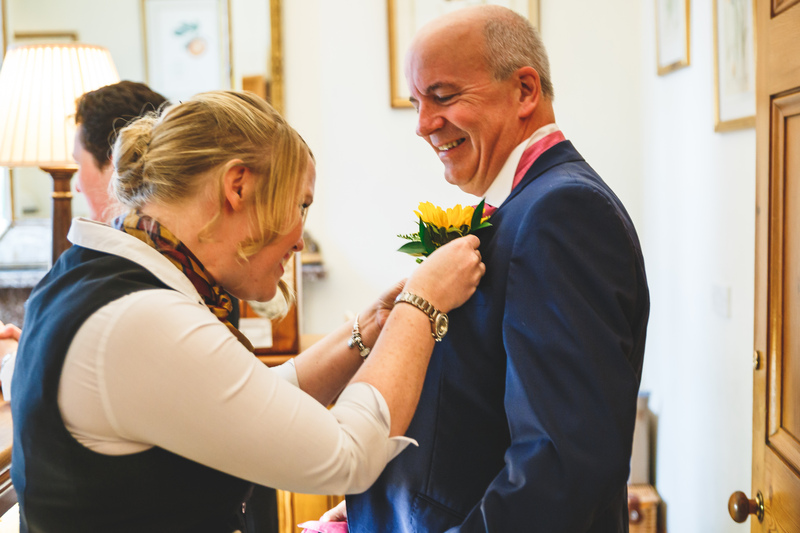 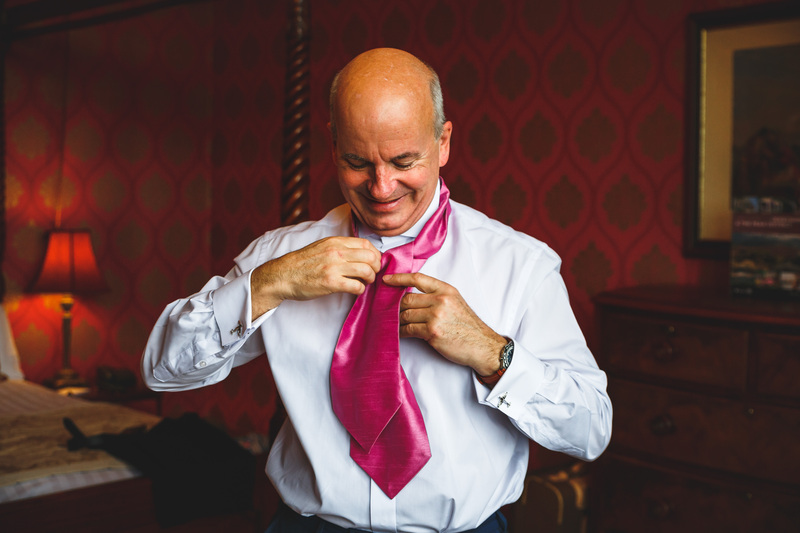 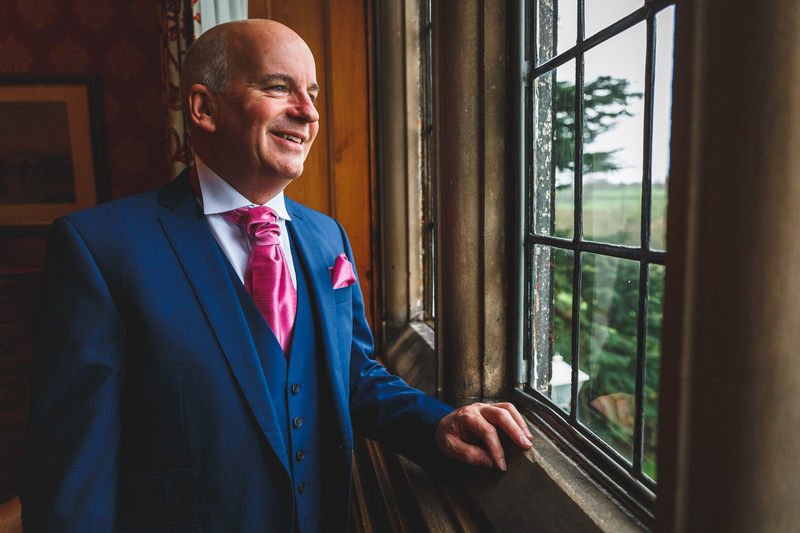 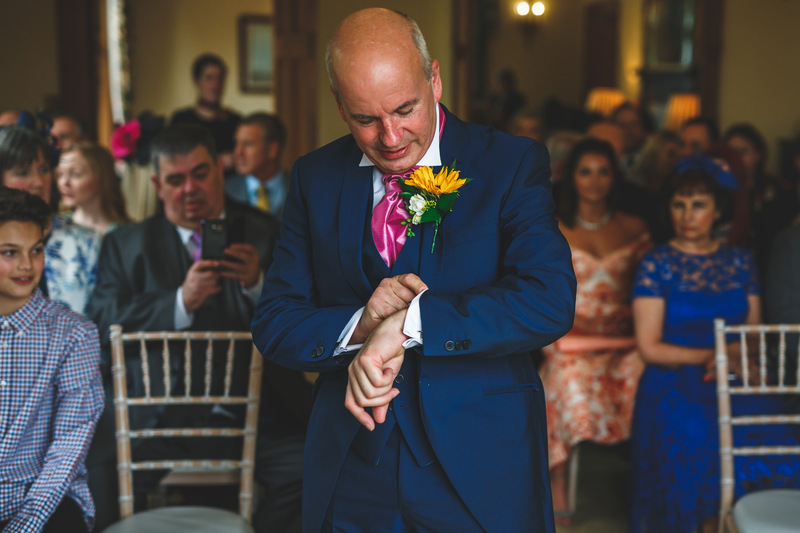 Meanwhile my 2nd photographer Alison was busy having a slightly drier start to her morning, capturing Neil getting ready at the stunning country house hotel, Callow Hall in Ashbourne, Derbyshire. 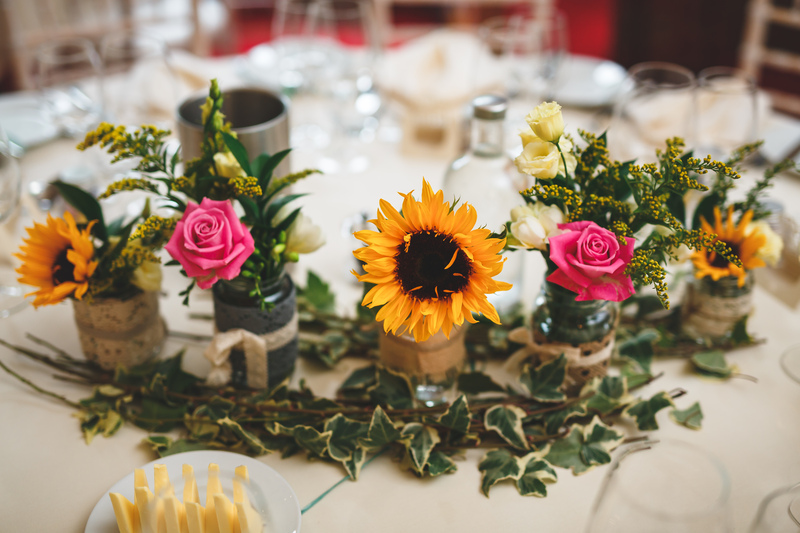 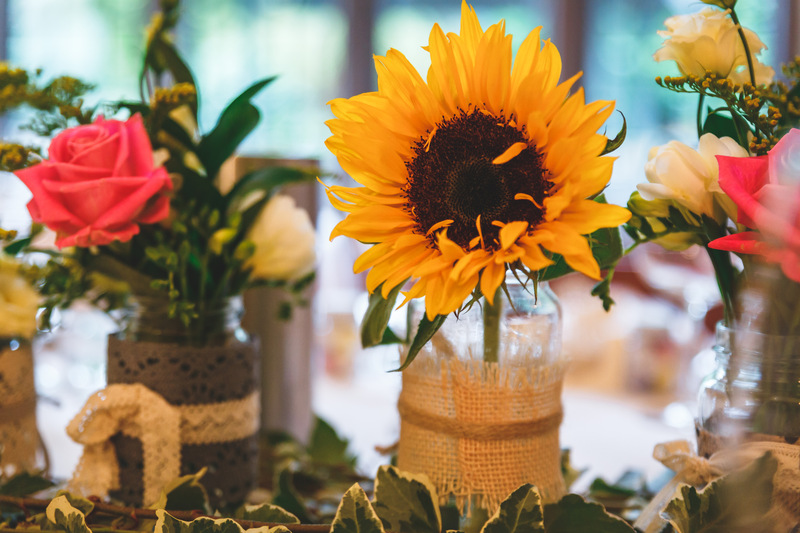 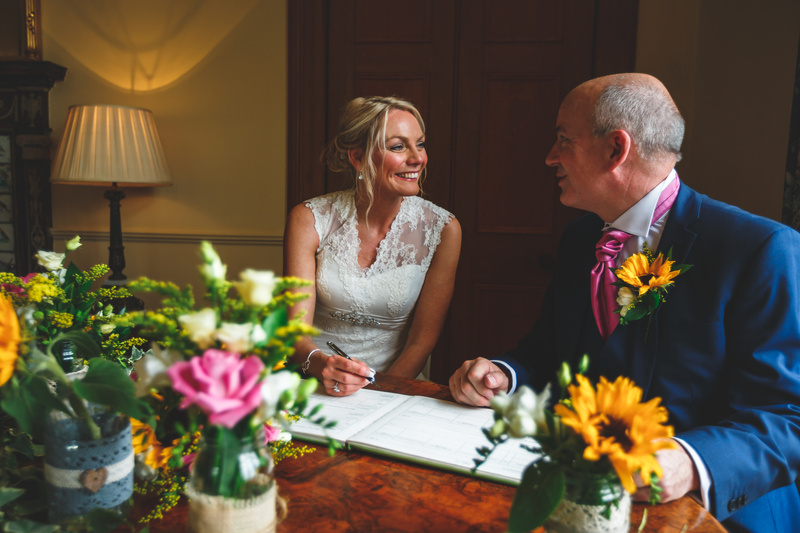 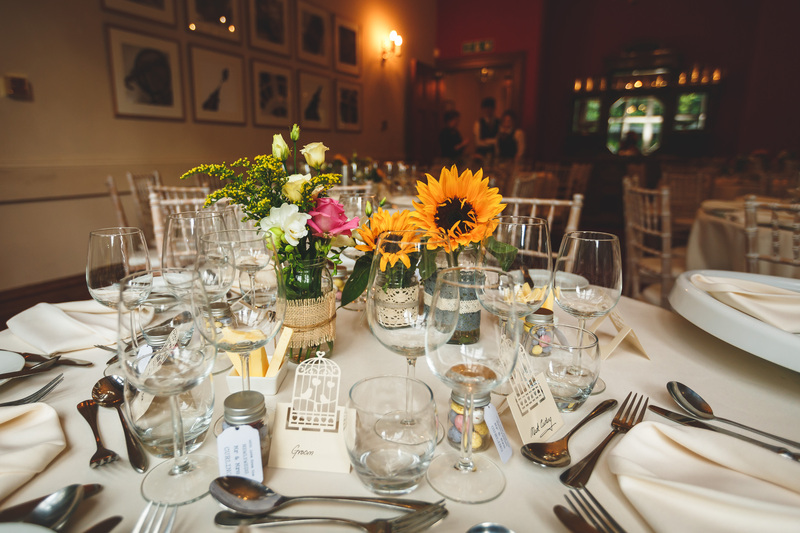 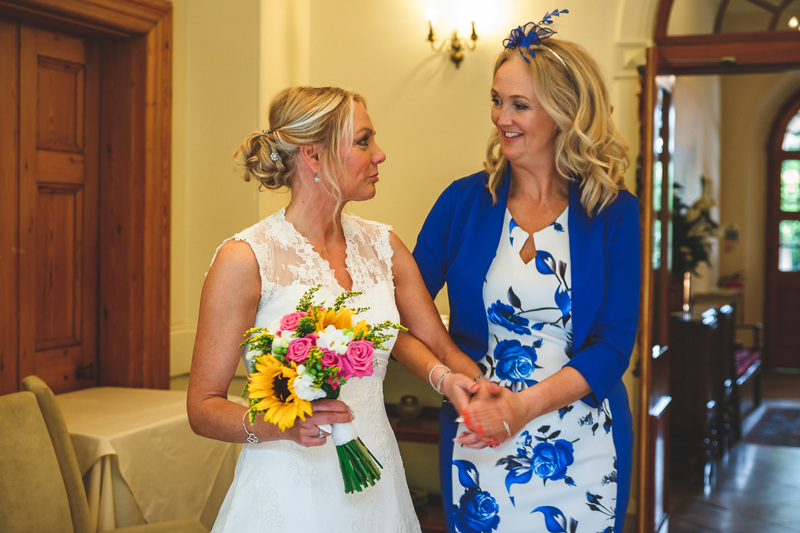 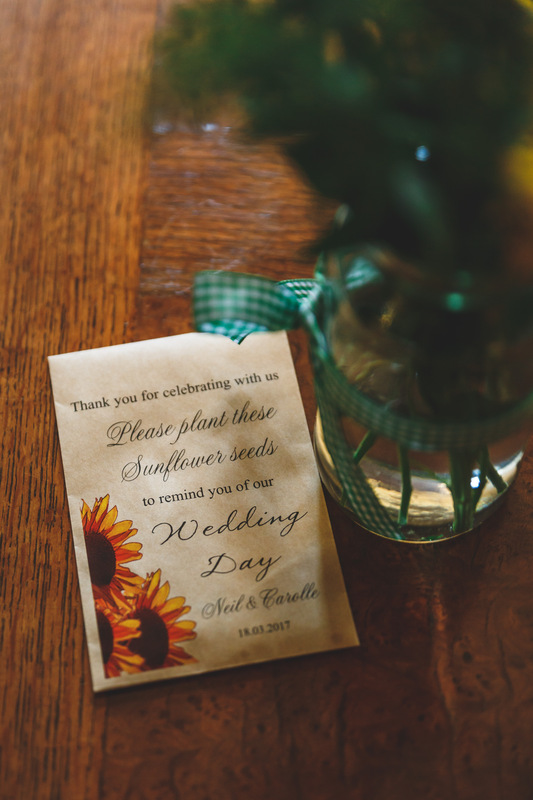 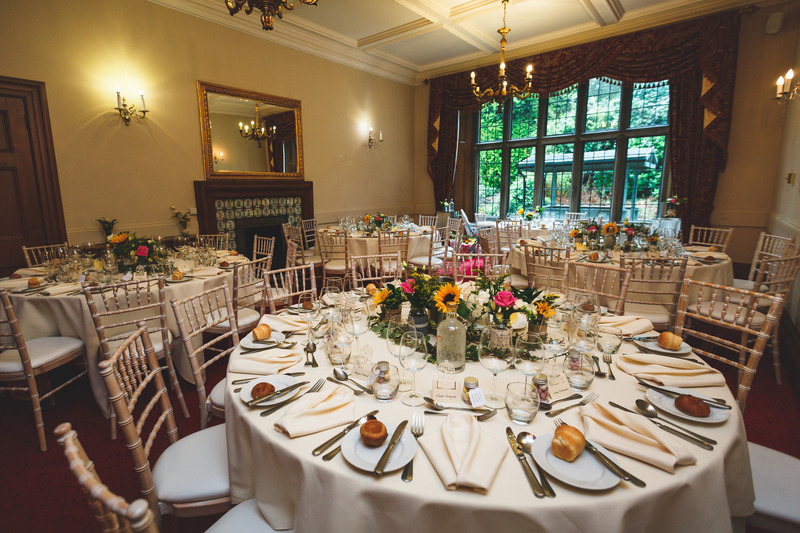 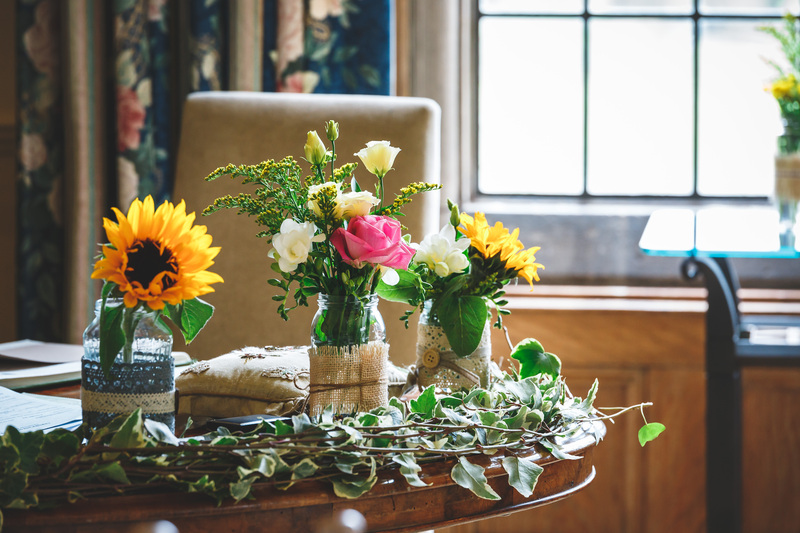 The venue was set up beautifully, with sunflowers and pink roses being used as button holes, table pieces and bouquets. 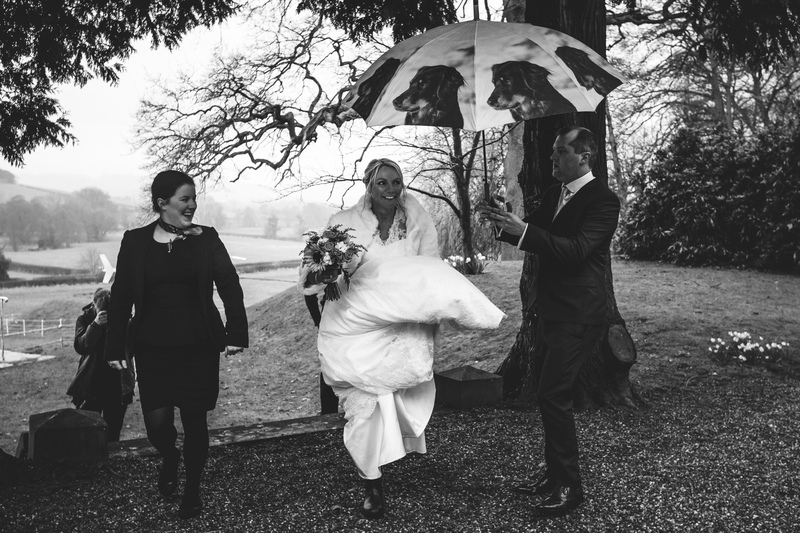 The guests arrived in time to see the bride’s impressive arrival and, even though the rain didn’t stop, the excitement for the day couldn’t be dampened. 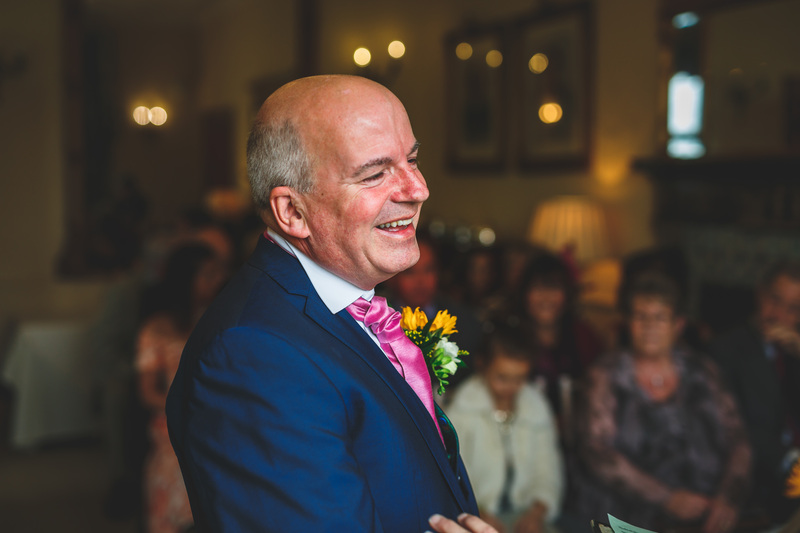 The service was full of love and laughter, shared with all their closest family and friends. 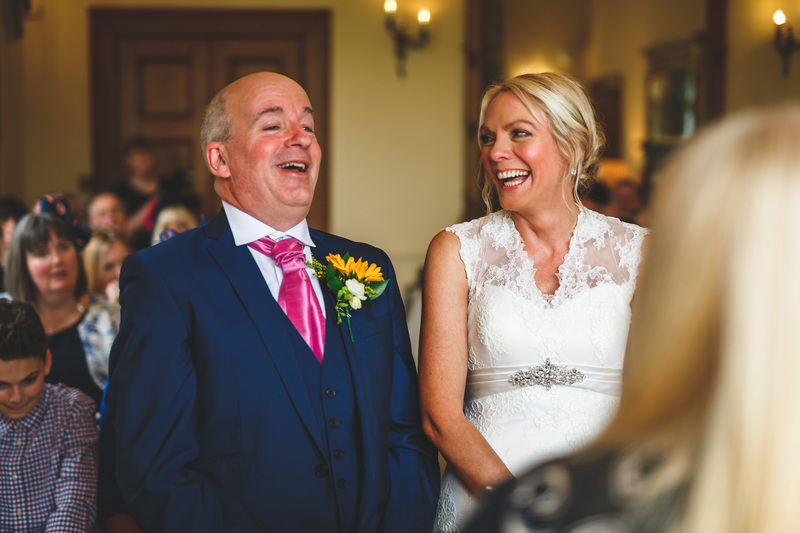 I’m sure for everyone it seemed like the ceremony flew past and all of a sudden Carolle and Neil were walking down the aisle as ‘Mr and Mrs’. 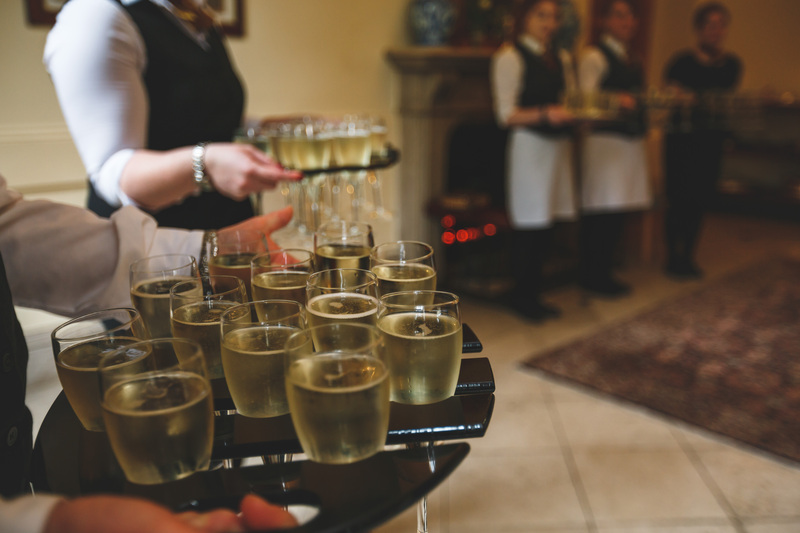 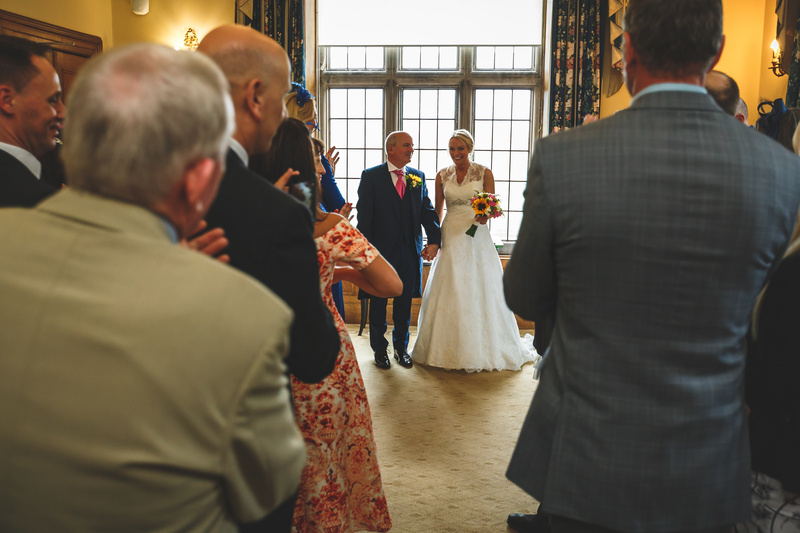 Callow Hall provides a perfect backdrop for a classy drinks reception and the interior, archways and stunning windows meant that the dreary weather outside didn’t prevent us from capturing lots of candid and group shots. 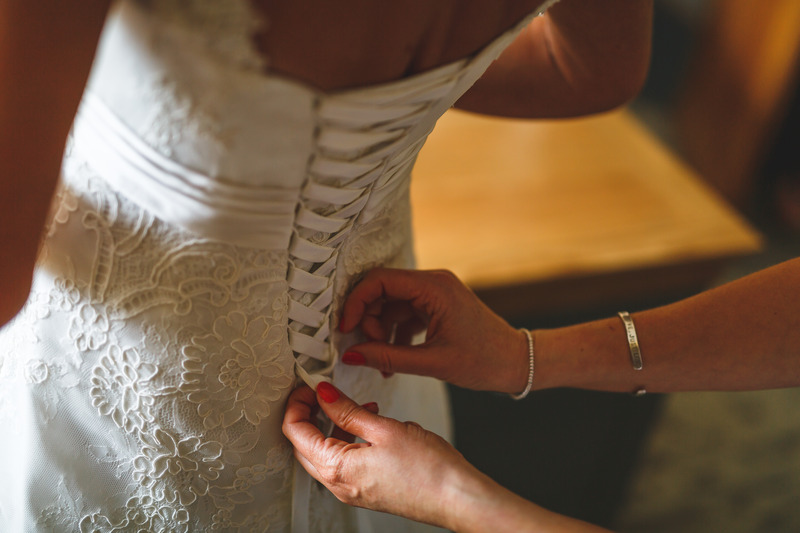 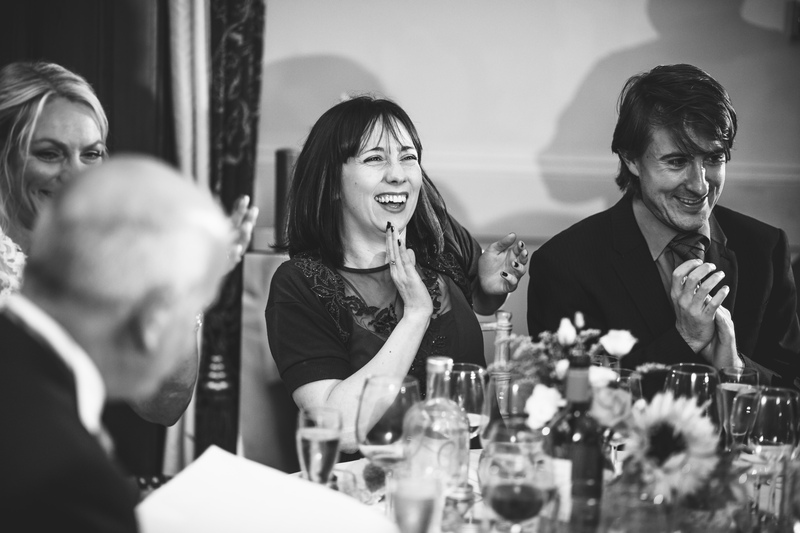 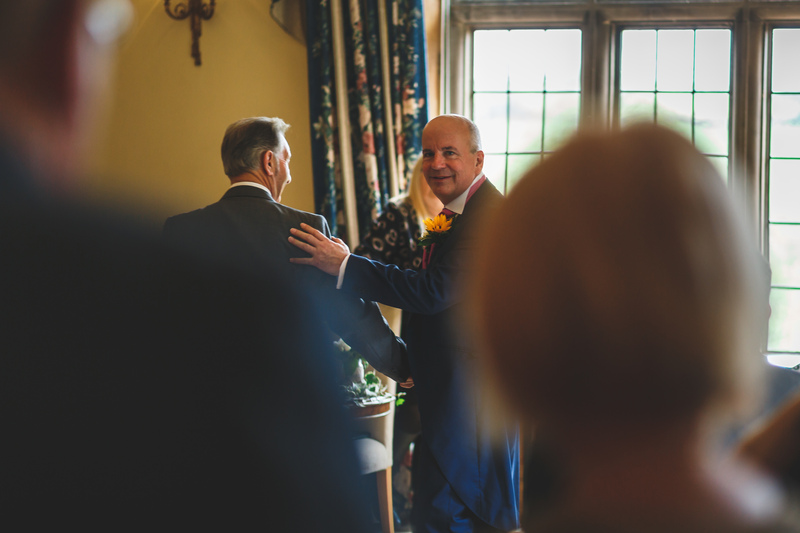 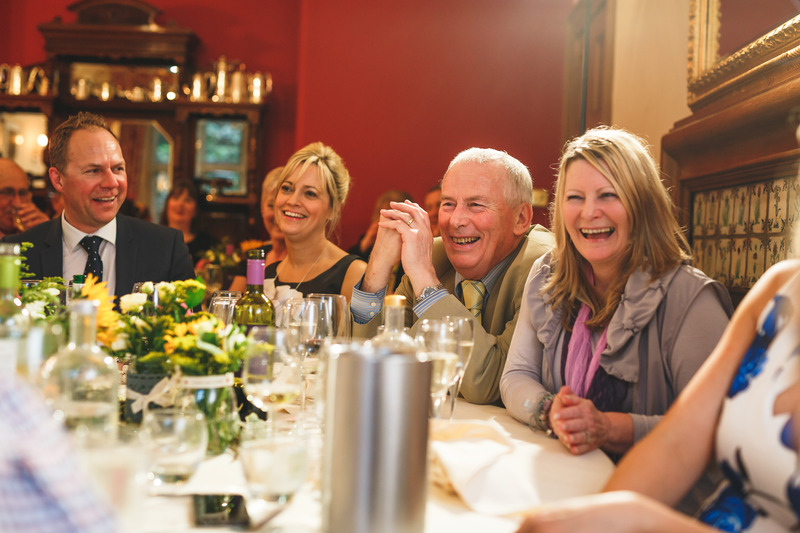 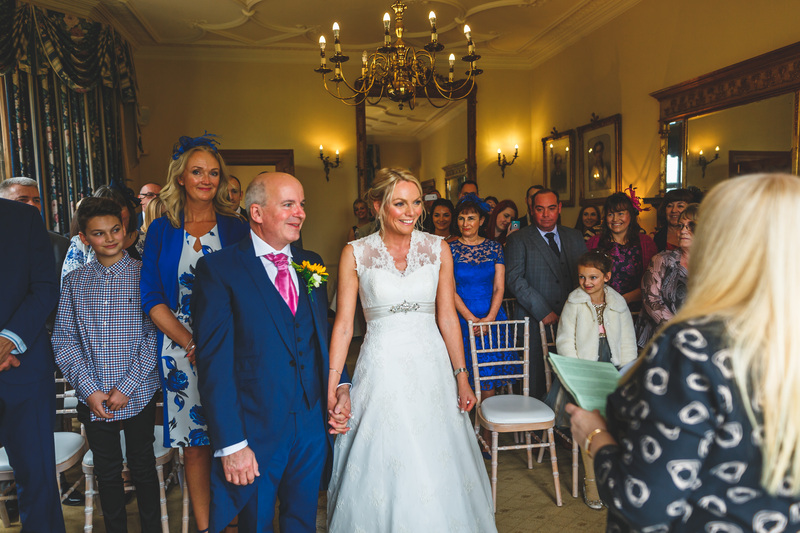 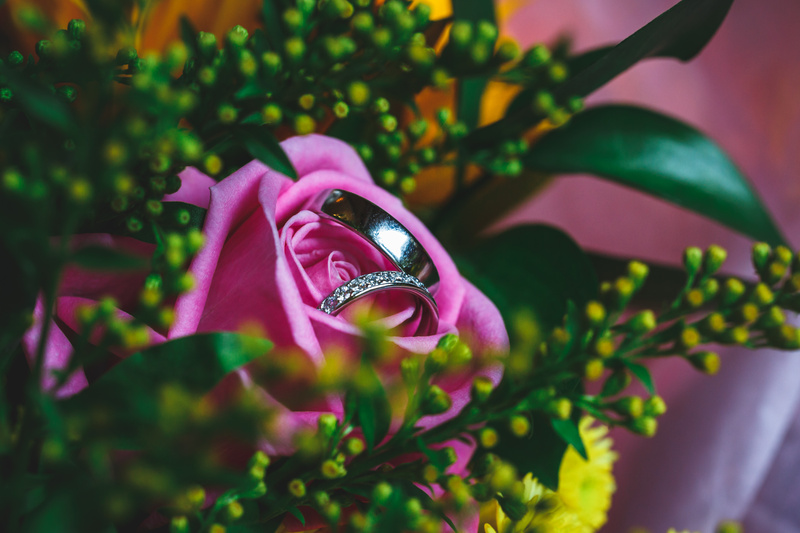 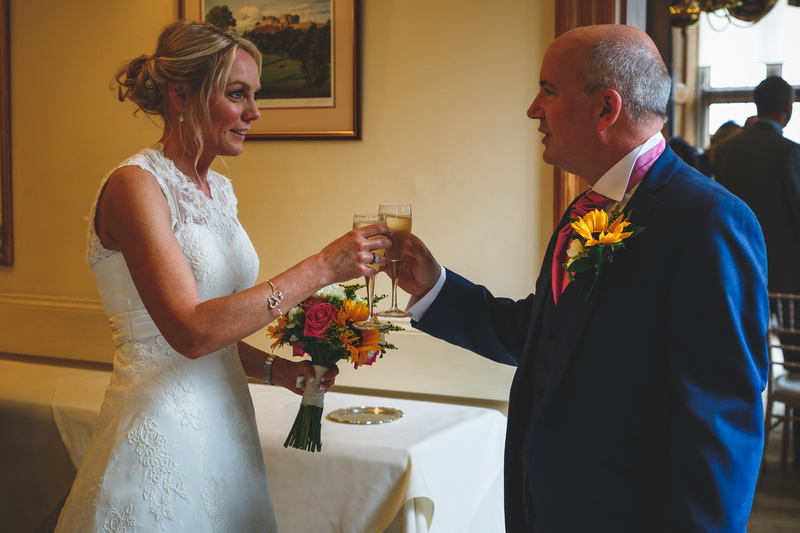 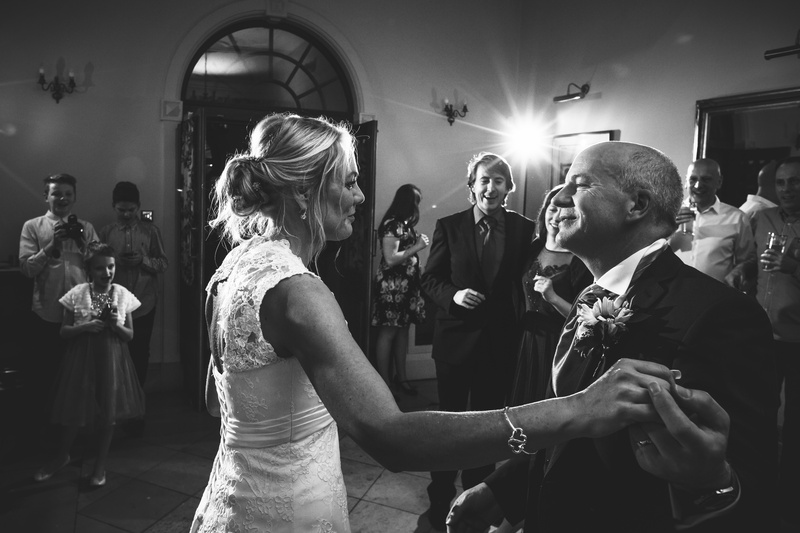 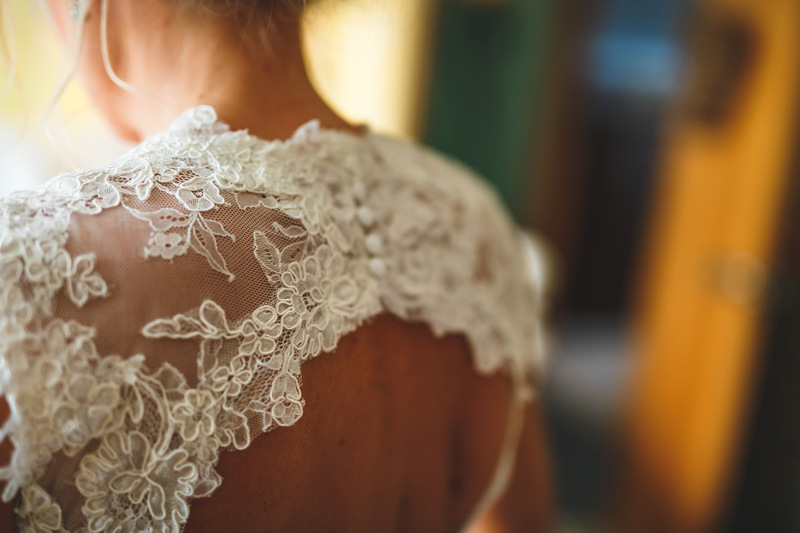 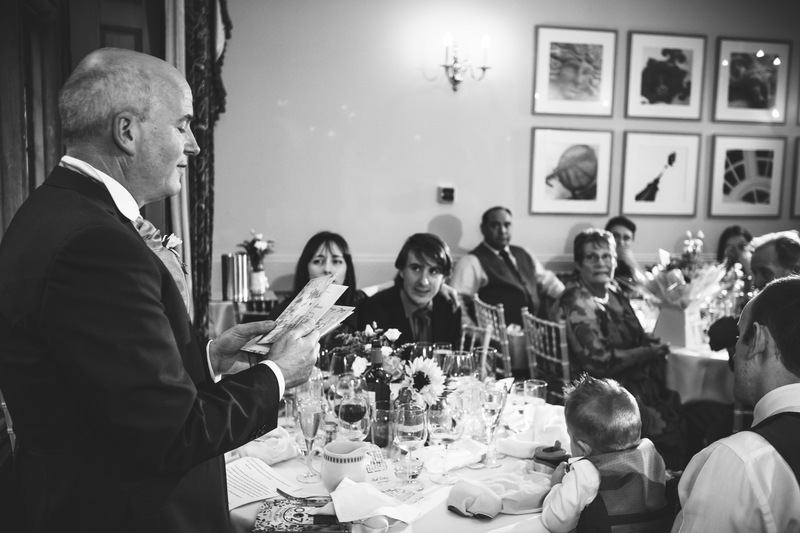 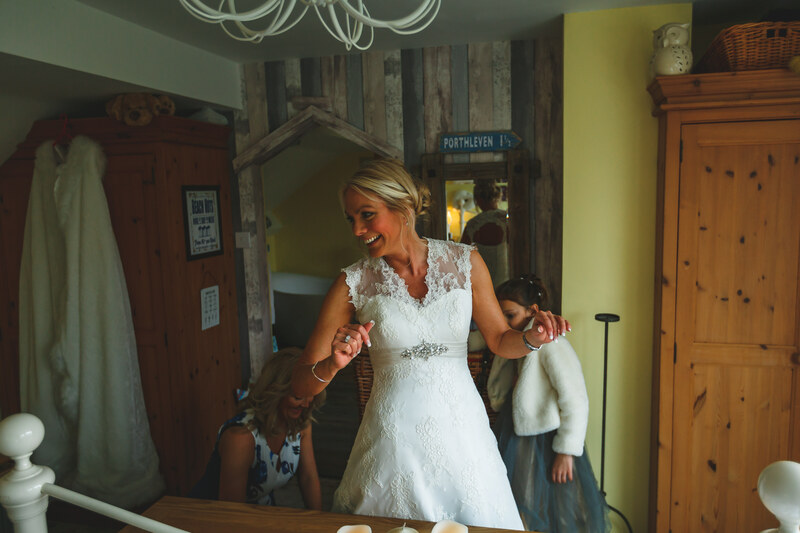 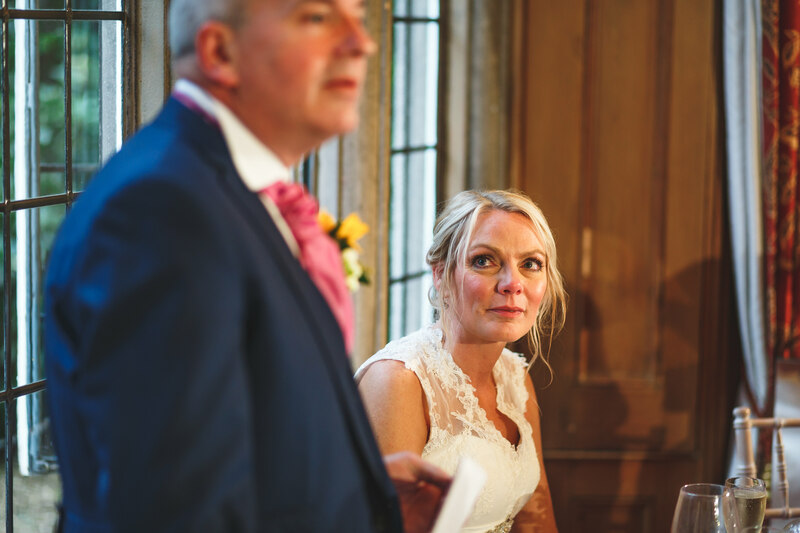 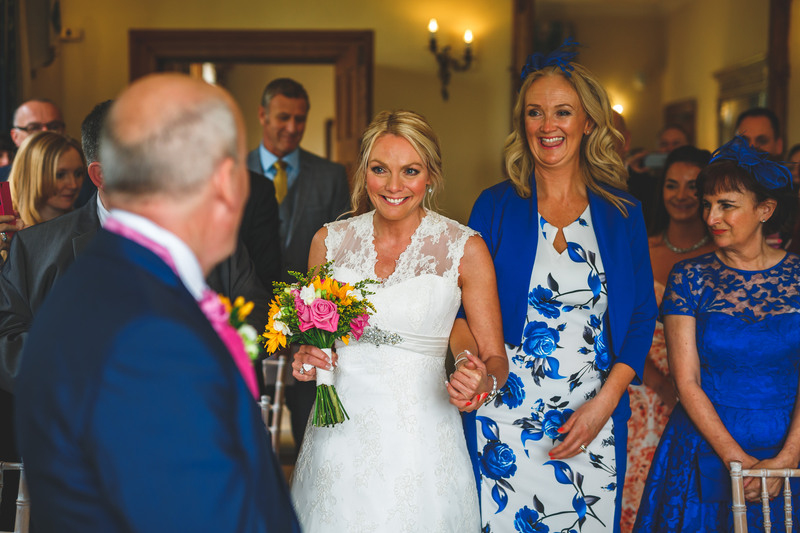 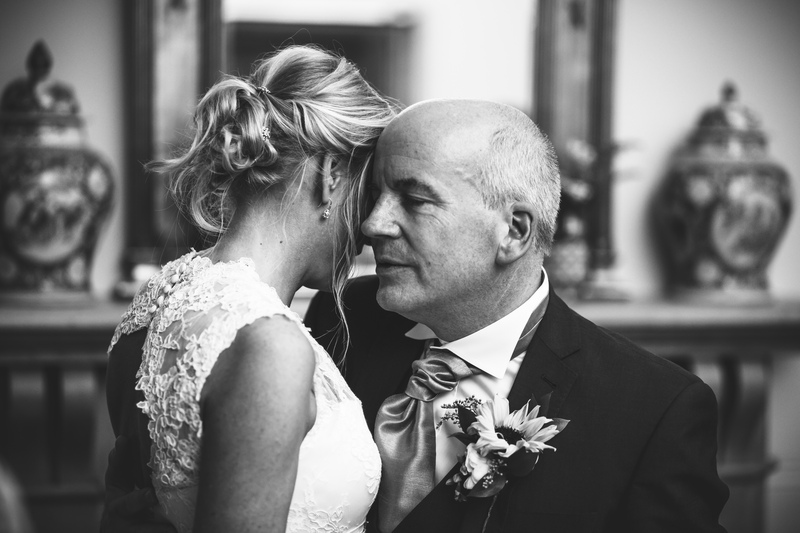 Following the drinks reception, the couple entered the room to a standing ovation as newlyweds for their wedding breakfast and emotional speeches. 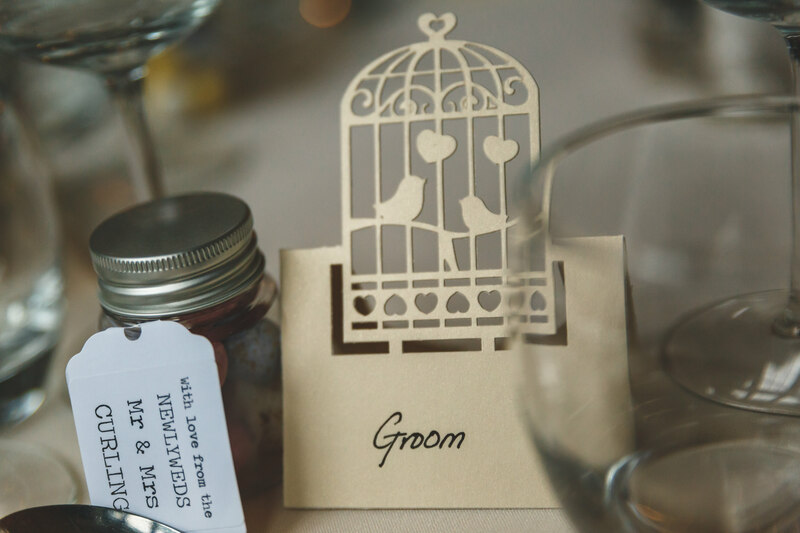 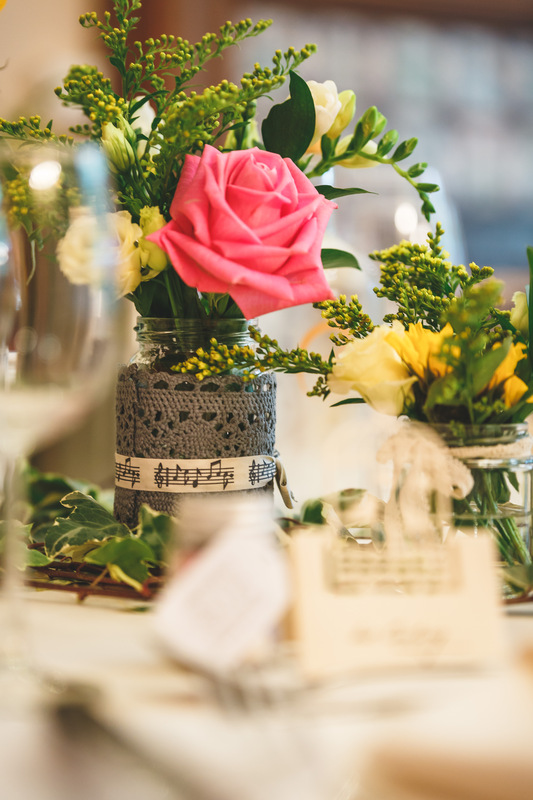 The tables were beautifully decorated with flowers, ivy and birdcage place cards. 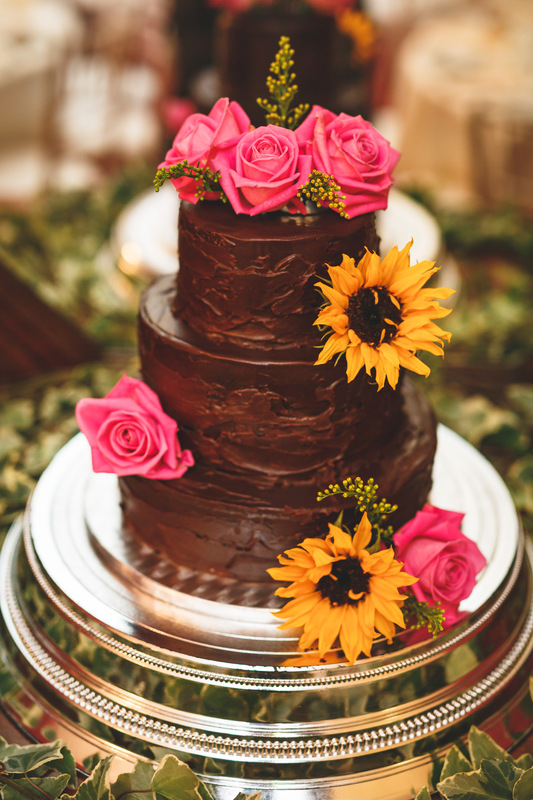 The sweet (in both senses of the word!) 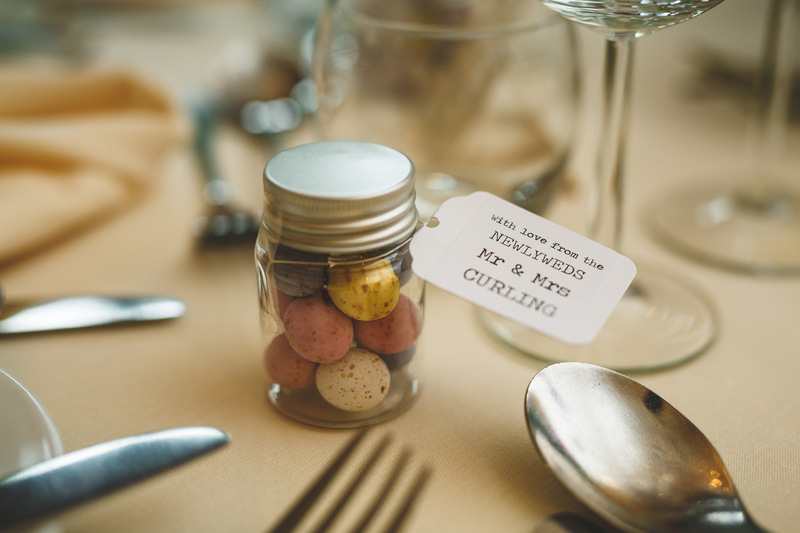 favours were appreciated by children and adults alike. 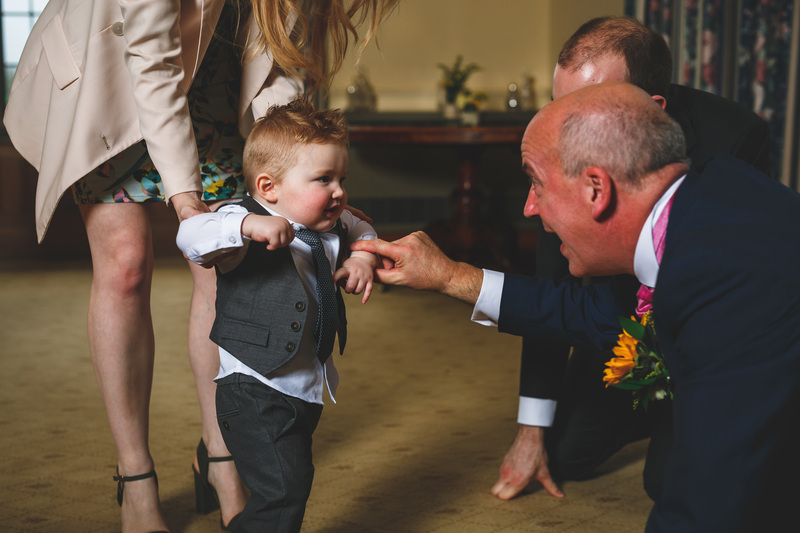 Oh, and a top tip to anyone who wants ideas for keeping children entertained (and quite a few adults too!) 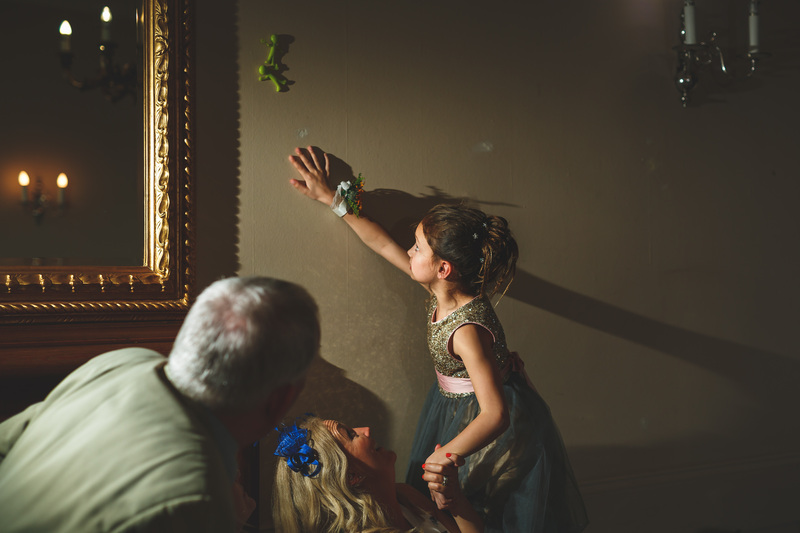 are those aliens or superheroes with sticky feet that you throw on walls and doors….or ceilings. 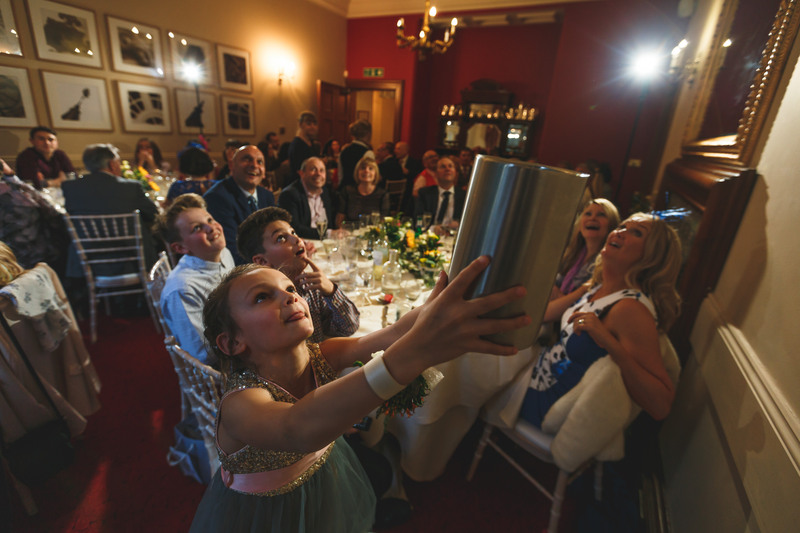 Waiting for them to drop (and using ice buckets to catch them in) keeps kids entertained for ages it would appear!! 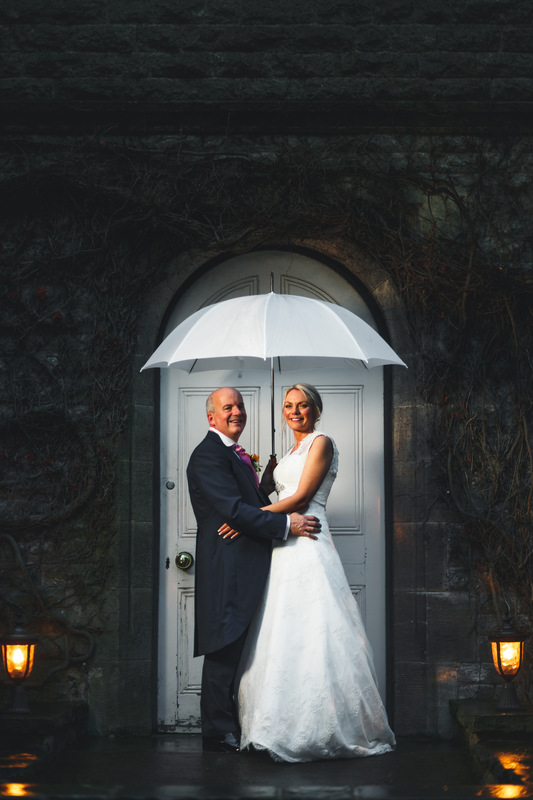 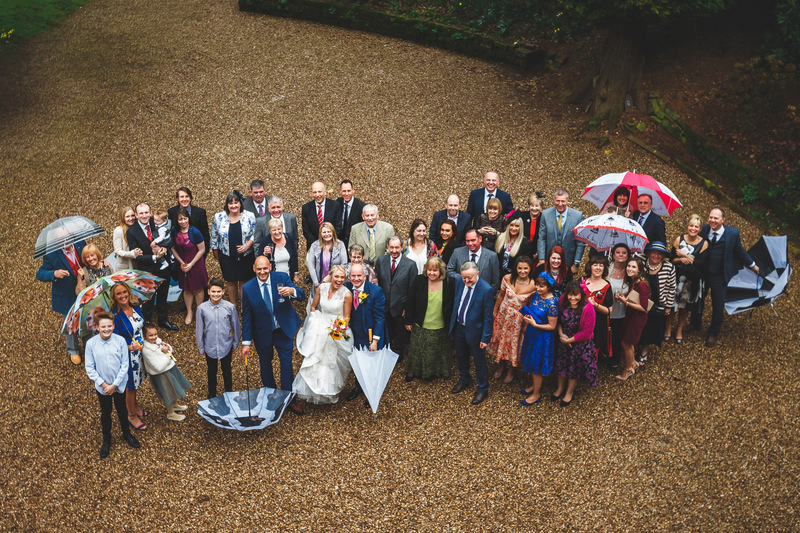 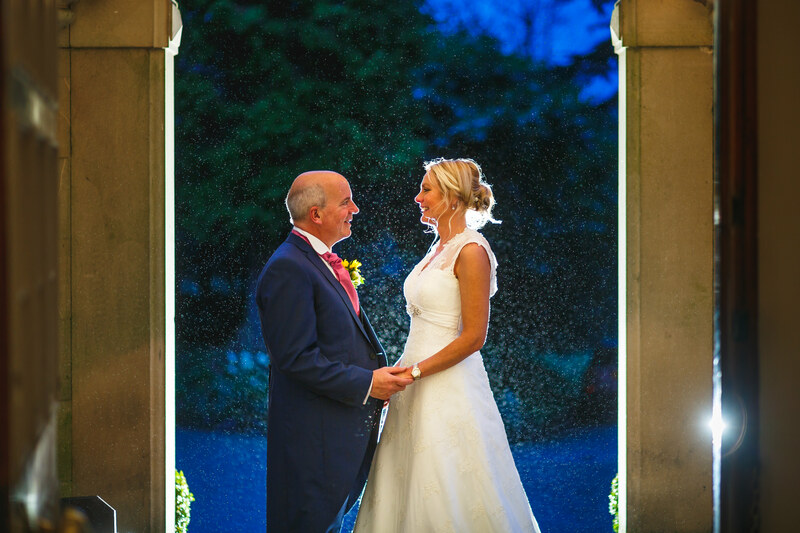 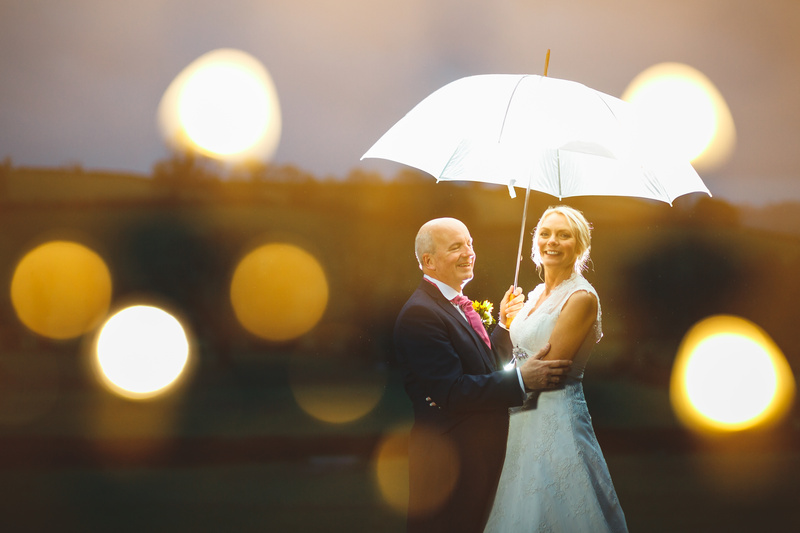 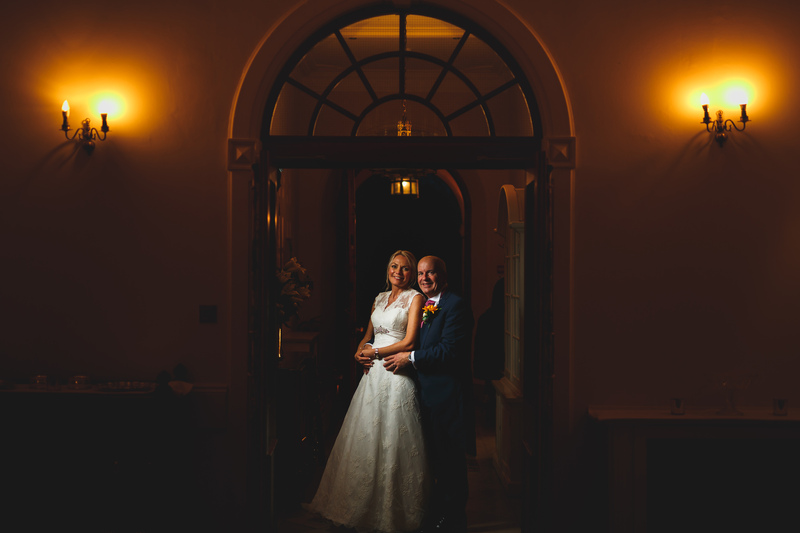 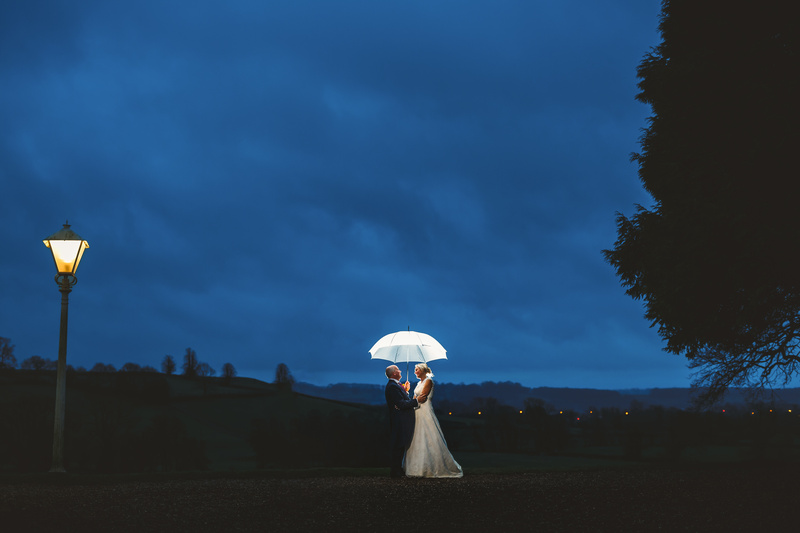 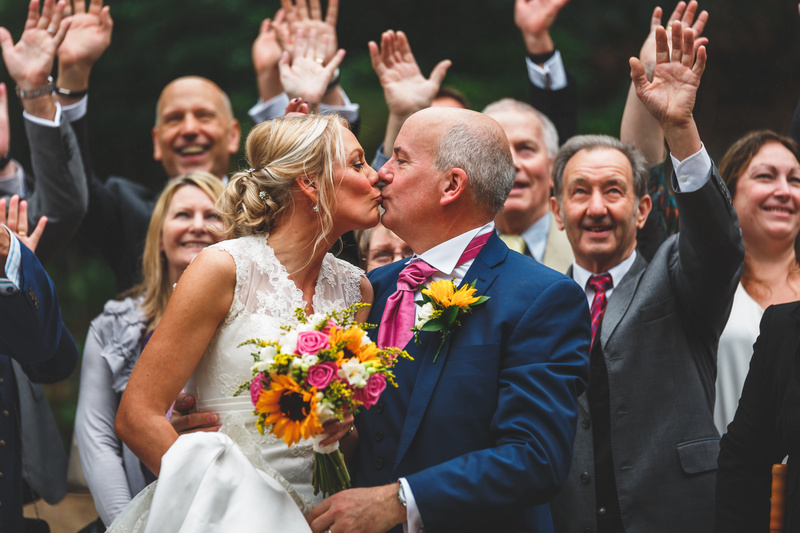 As had been evident throughout their whole wedding day Carolle and Neil were not to be put off by the bad weather so after the wedding breakfast, we were able to use the exterior of Callow Hall for some cool umbrella shots. 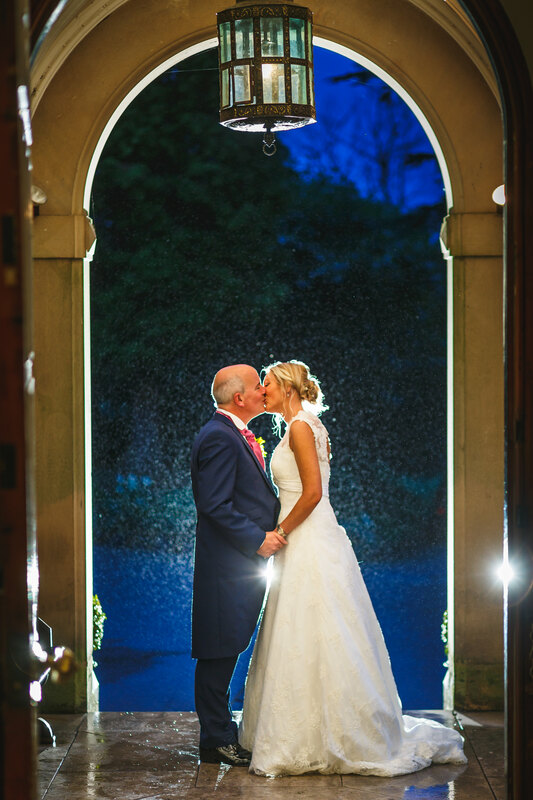 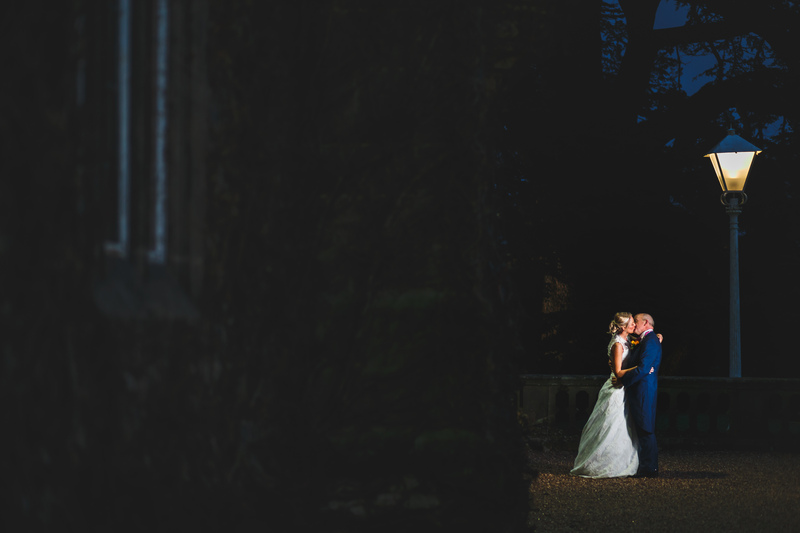 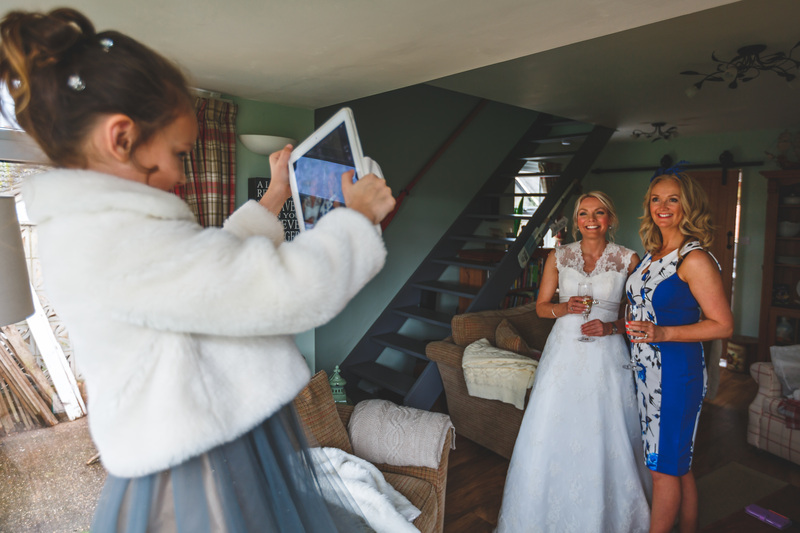 The newlyweds really wanted to have some photographs by the lamp-post outside the venue so I was pleased that the weather had a little break so we could fulfil that wish – made me feel we had stepped through the wardrobe doors into Narnia! 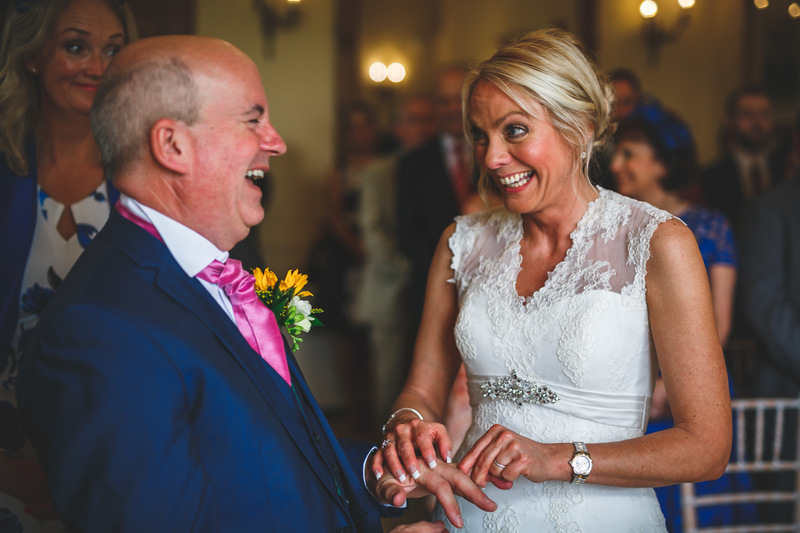 The new Mr and Mrs Curling, and all their guests could not have made me feel more welcome at the wedding and it was such a fantastic day to capture. 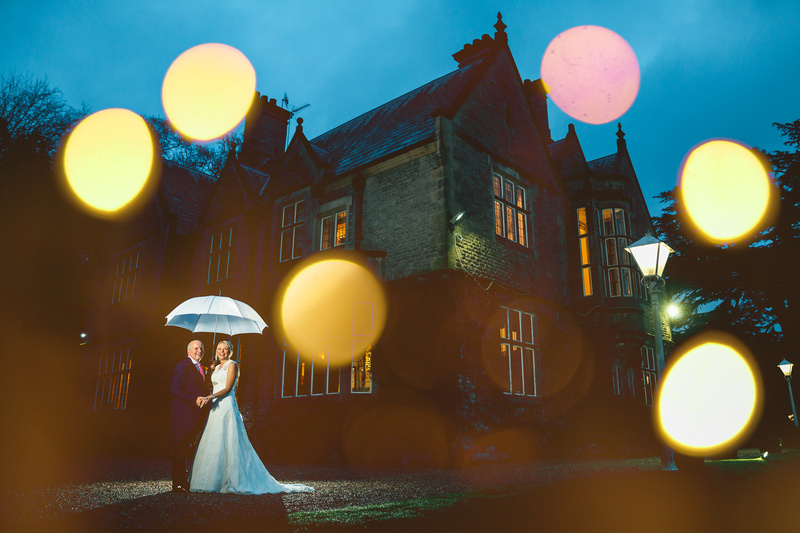 Shooting at Callow Hall for the first time was a privilege, the staff were excellent and I look forward to working there again in the future. 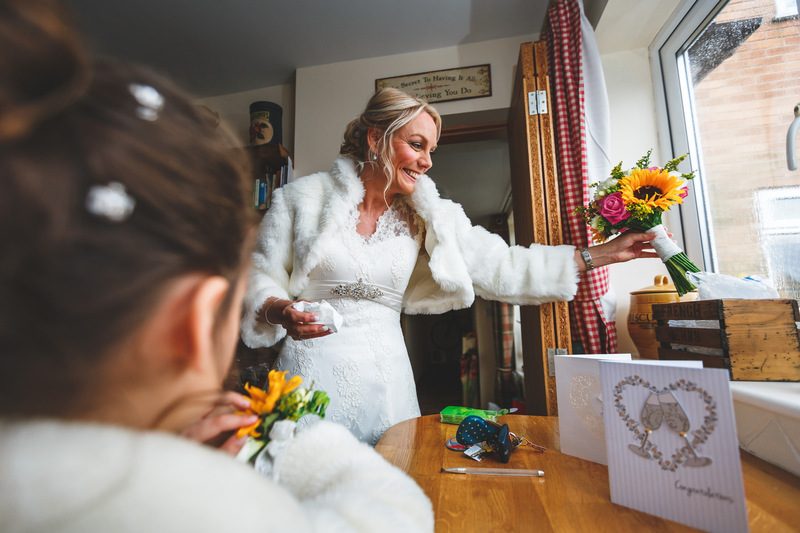 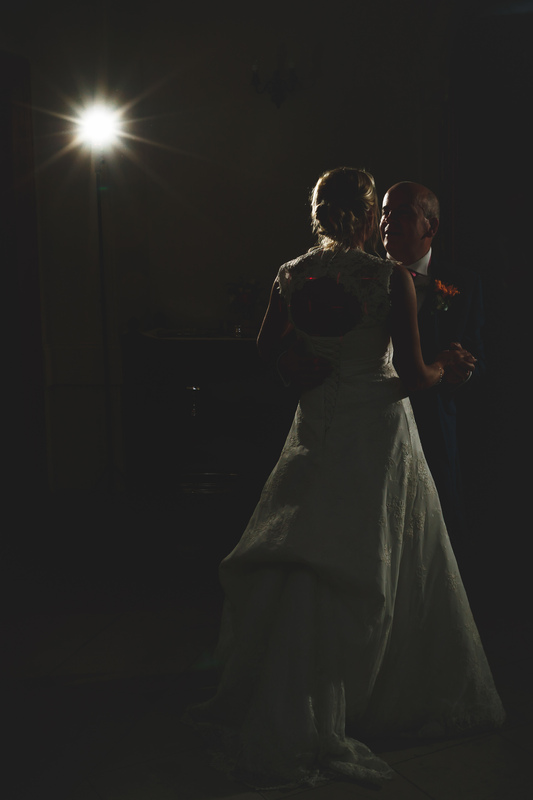 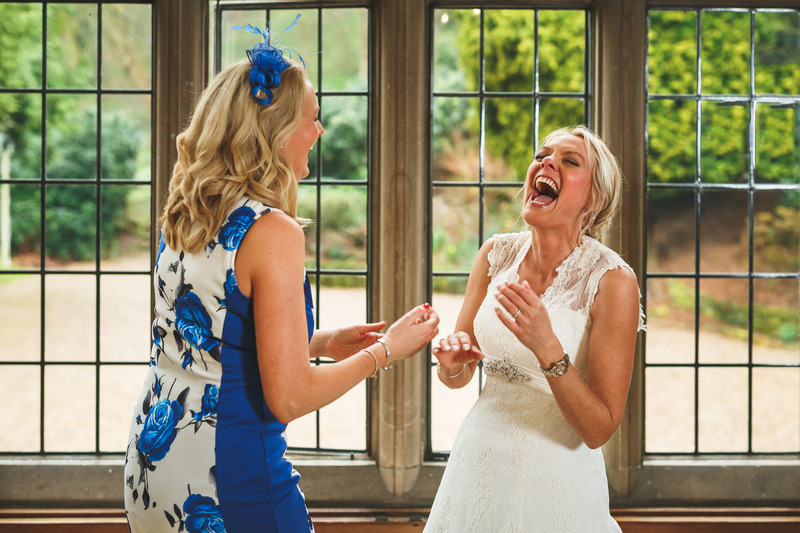 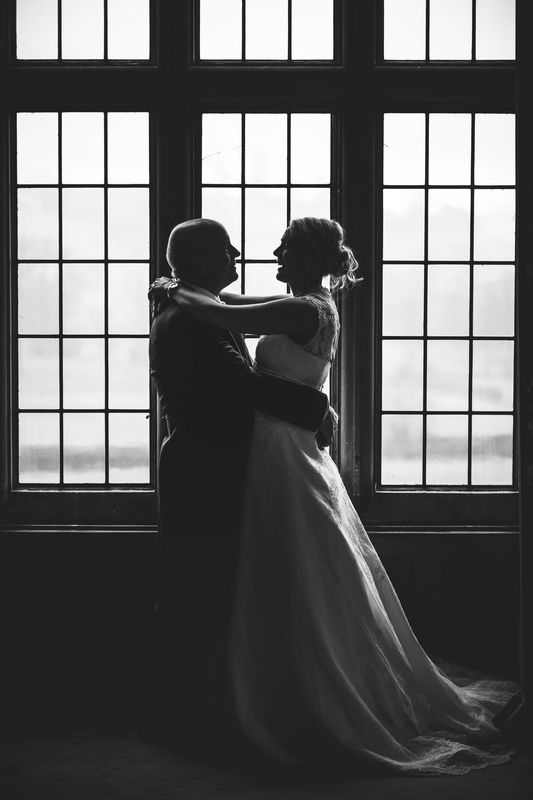 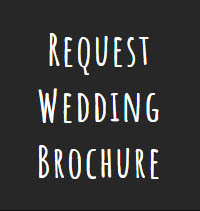 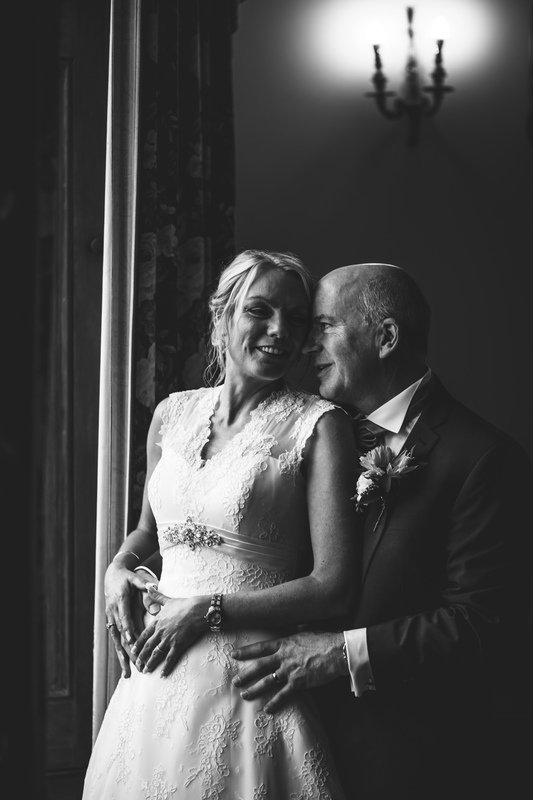 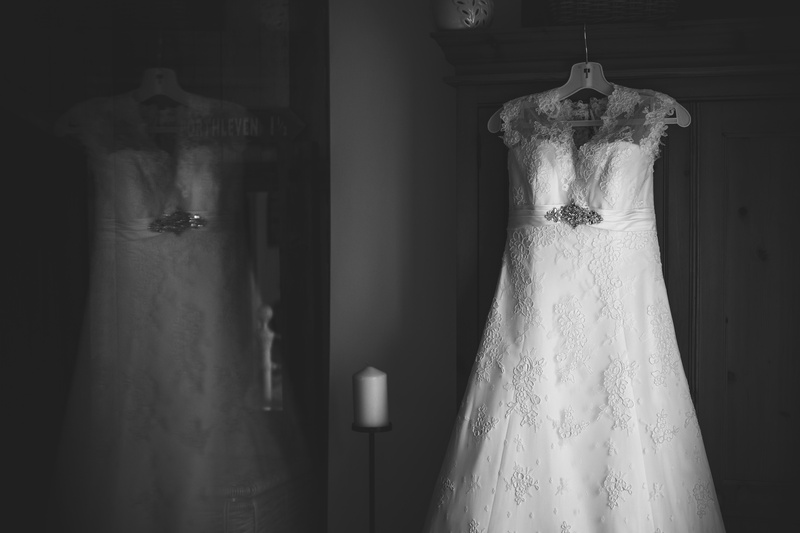 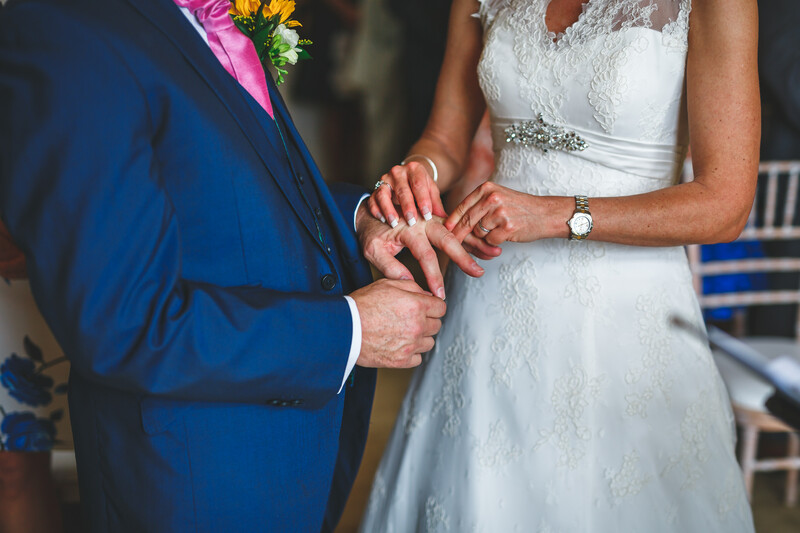 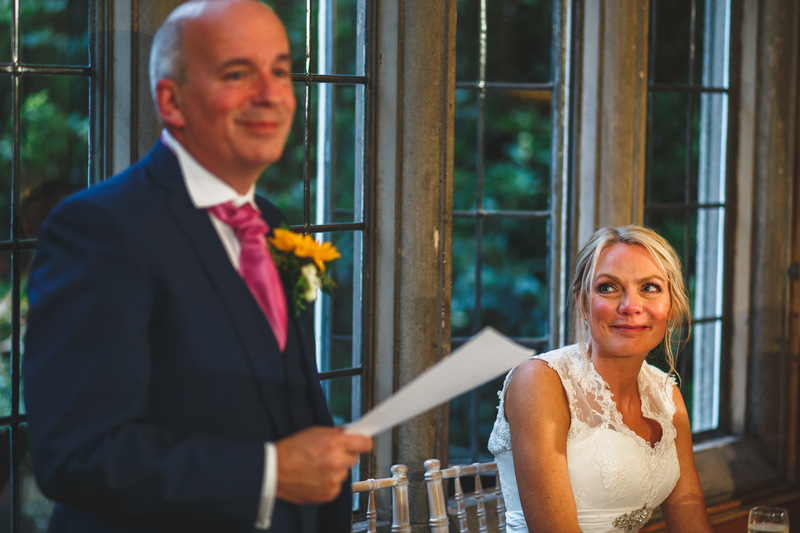 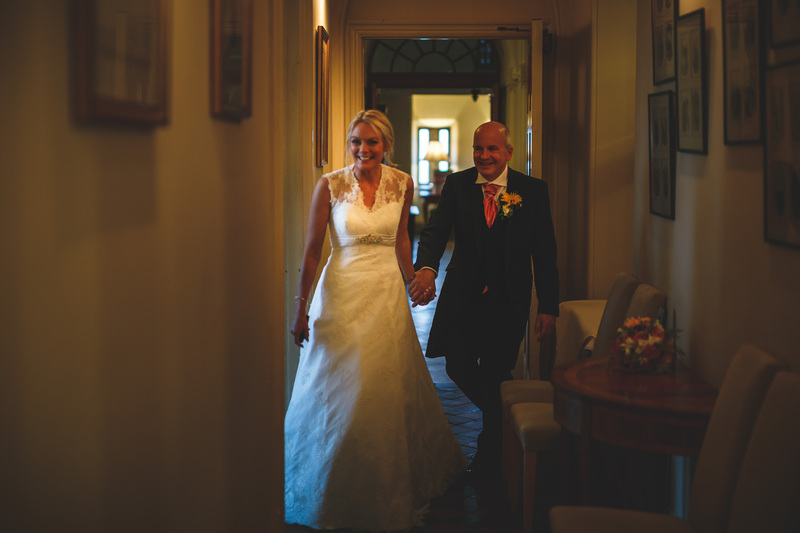 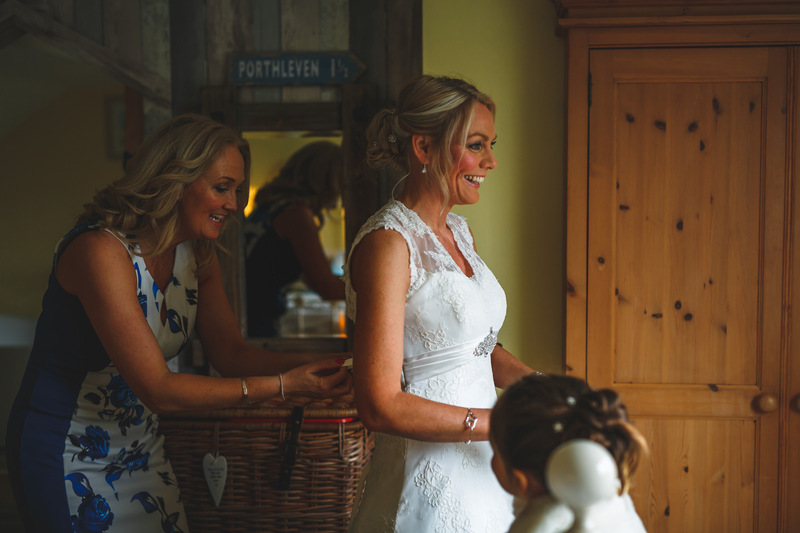 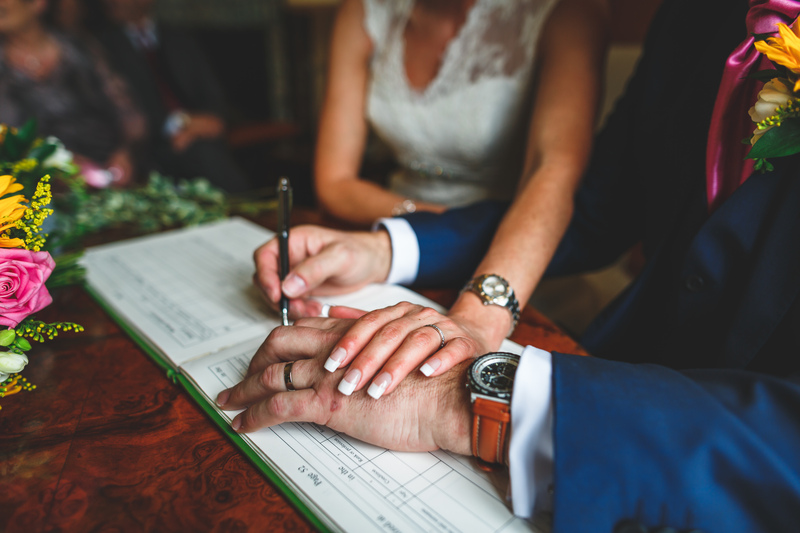 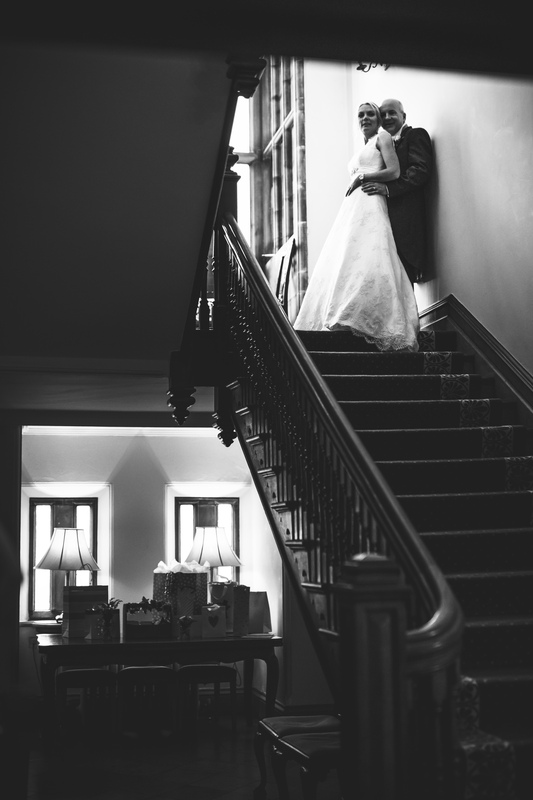 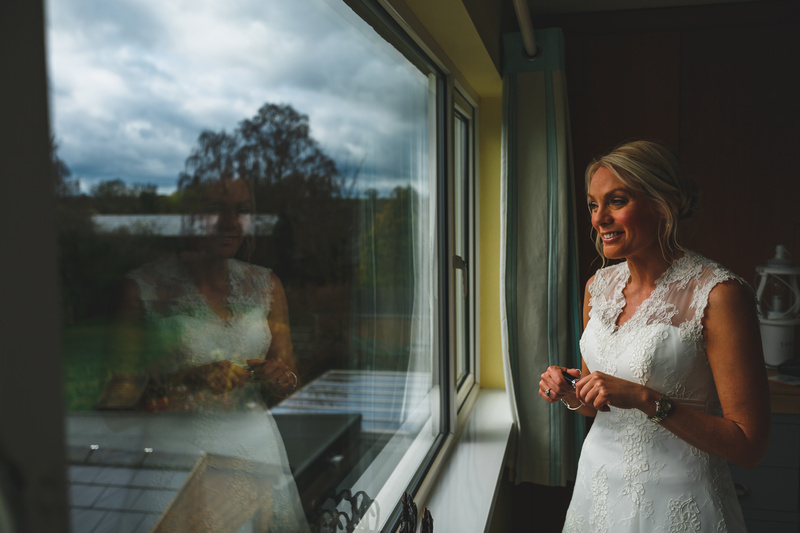 If you are interested in booking me for Callow Hall Wedding Photography then please don’t hesitate to get in touch here.